Herman Melville, visiting London in 1850, described his walk through a choking and poisonous “London particular”. It was an “old-fashioned pea soup London fog – of a gamboge colour.” Gamboge is a mustard-coloured pigment used to dye Buddhist monks’ robes and varnish violins. And it’s roughly the same colour as the murky split pea soup that the “London particular” loaned its name to. Fog no longer shrouds the capital, and split pea soup is rarely seen on its menus. But on a cold and drizzly night in New Cross, we still have the cockle-warming bistro The London Particular, a short dash across the bridge from the station. Unfortunately they weren’t serving that famously comforting soup, but a display of fine, fast and reasonably priced English home-style cooking was more than enough to soothe our disappointment. In a comfortably care-polished and intimate setting, friendly staff serve rib-sticking seasonal dishes to a communal table and a few precarious-looking stools at the walls. Locally sourced meat, veg, cheese and bread are prepared in the tiny open kitchen, the homely feel of this place only strengthened by the fact you can hear and smell the chef cooking your dinner just a step around the corner. Jugs of tap water and mint are supplied automatically and we order beers from the Kernel and Partizan breweries. Cocktails can be airlifted over from the LP Bar next door. These are sharing plates and the food comes when it’s ready. We quickly realise it’s spot on for wet, chilly customers – who could fail to be defrosted even by the mention of a smoky aubergine and merguez stew or a squash, sage, chilli and Cashel Blue gratin? 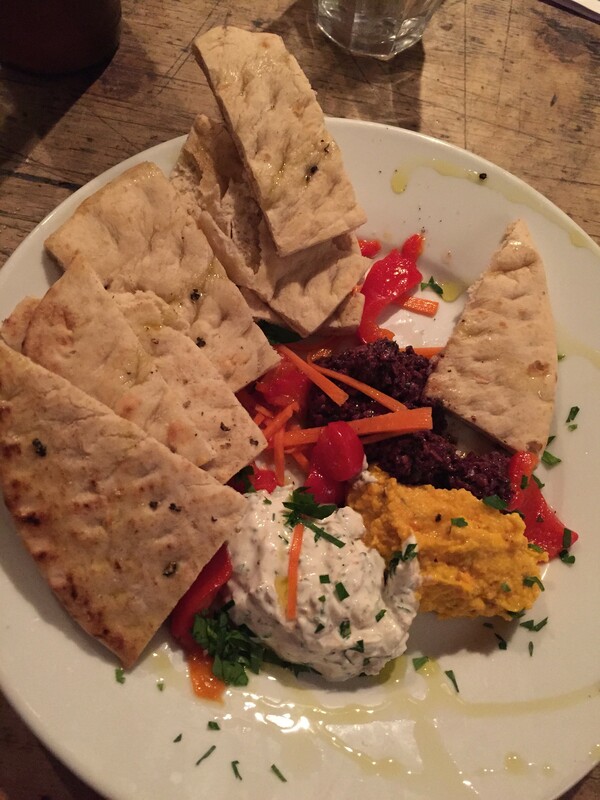 Warm, pillowy flatbreads jostle for space on the plate with bright carrot and celeriac puree, roast peppers, tapenade and herb yoghurt. 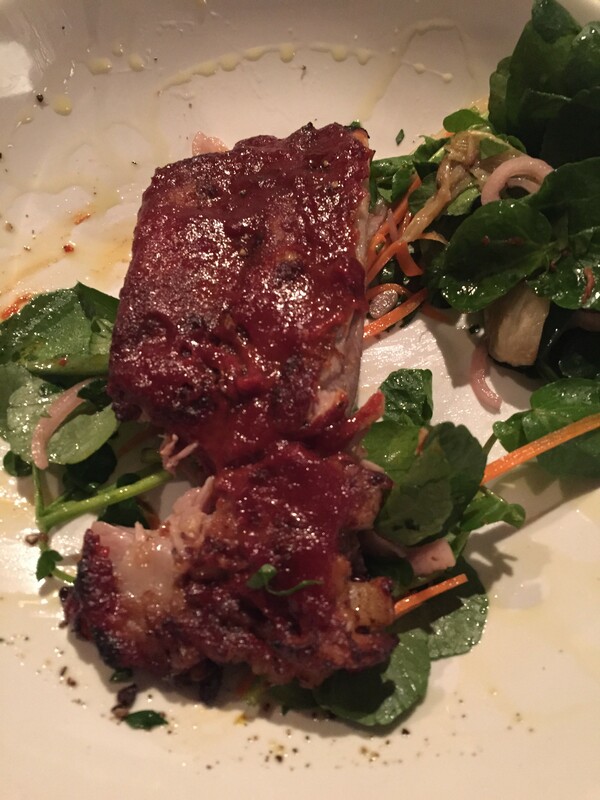 Punchy harissa-slicked sticky pork ribs are squabbled over, gnawed and gnawed again. A tangle of superb pulled brisket with gutsy red wine jus is paired with a slab of dauphinoise, the dish that potatoes dream of growing up to be. 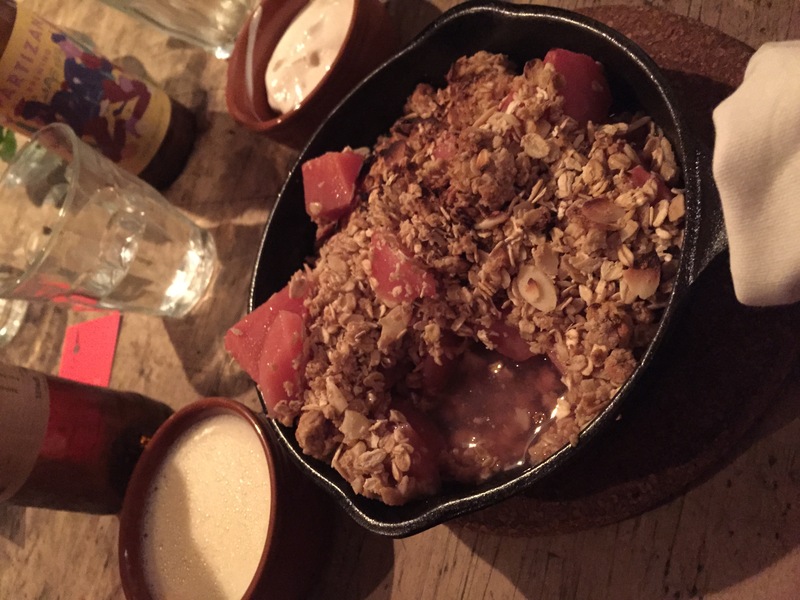 A red-hot skillet of quince crumble follows, paired with cinnamon-spiked yoghurt and an off-menu custard graciously knocked up and gratefully received. It’s all quite simple but perfectly executed. Coffee is brought in from the LP bar next door, and it’s excellent. Outside in the doorway a huddle of smokers stare dispiritedly at the snarling traffic of the New Cross Road. Our age has its own noxious fumes of course. 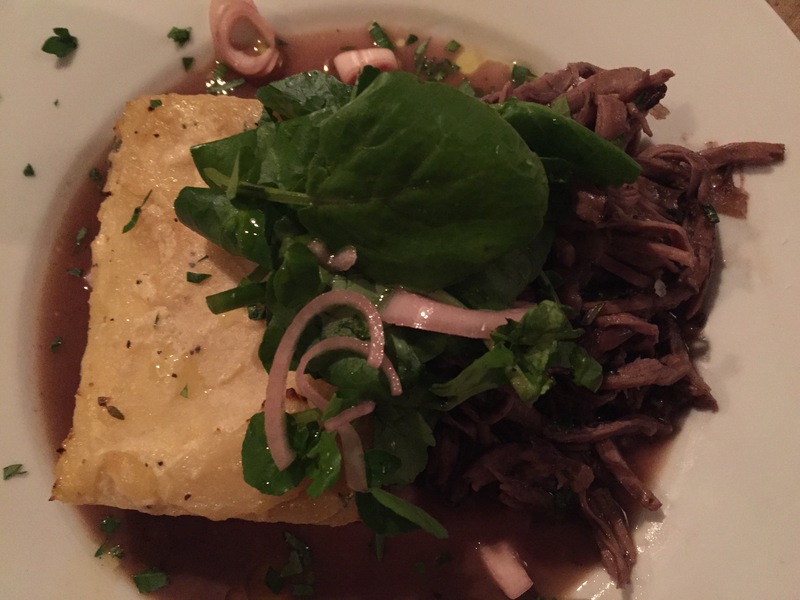 But with such bold, tasty cooking, this London Particular shouldn’t be drifting away any time soon. The London Particular, 399 New Cross Road, SE14 6LA. This entry was posted in Eating and tagged in fog, London, London particular, New Cross, restaurant, SE15.